Track inventory through the entire supply chain, from raw materials received in the warehouse, to work in progress inventory to finished goods shipped to the customers. 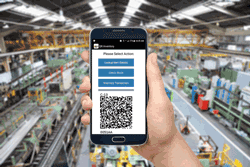 With QR Inventory your employees can easily record all components and materials as they receive them from the suppliers and use in production. They can use their own smartphones (BYOD) or company issued mobile devices to scan barcode or QR code label, record a transaction and collect any additional information. You define what information needs to be collected and reported via the web dashboard. All tracking is done in real time, in the warehouse or the shop floor. Recorded transactions immediately update inventory in a central database, so all authorized employees have an access to the current inventory stock levels and inventory locations. Track building of complex, multi-level assemblies on the shop floor. Track used materials, parts and components by lot numbers / serial numbers. Trace materials used in the finished product to their origin, achieve end-to-end traceability. If you have strict traceability requirements, QR Inventory will allow you to digitally record all necessary data on the spot. Your employees will use mobile devices for barcode scanning and data collection - no manual entries or paperwork is required. The process of recording lot numbers / serial numbers of components used in the assemblies or product batches is simple and straightforward. You create a generic list of components used in the assemblies or product batches via the web dashboard. Your employees pull this list on a smartphone, and scan in lot number / serial number of components they are using against the list. Alternatively, you can build serialized on demand assemblies on-the-go, without using a list - just scan added components as assembly is being built. Regardless of the method you are using, you always will be able to check lot numbers / serial numbers of the components for each assembly and product batch. Data are sent to a secure central database, and can be easily accessed and searched to find all required information in case of a problem or recall. Track every step of the production process on the shop floor. Give all stakeholders live access to everything in production. With QR Inventory, your employees can easily track each product or project progress as it is moved from step to step. They can do it in real time, on the shop floor, using mobile devices. If necessary, they can collect data on each project step (from serial numbers of used instruments, equipment and containers to the environmental conditions, and any other data your business workflow requires), and fill out quality control / testing forms. You create custom workflows, define steps and create instructions for the employees via an admin web dashboard. Create custom mobile forms so that your employees could collect all necessary data during the production. QR Inventory allows you to completely eliminate physical paperwork. Instead, you will have all required production documentation in digital form, easily searchable and accessible on demand from anywhere. Your employees can collect all data that you need to record and report on the shop floor using mobile forms. Each form can be connected to the specific production process step(s), or used independently for the discrete processes (such as recording of equipment calibration or maintenance). You create the forms that you need via the admin web dashboard, and optionally link them to the specific production steps. In addition to accessing collected documentation online via reports, you can create custom formatted pdf reports for clients, outside auditors or internal distribution. Get actionable insights from the collected data with custom reports and advanced data analytics. All data collected for the production process, from used inventory to project steps and stages to filled out forms, are securely stored in a centralized cloud location. Authorized admin users can access reports on live projects status and progress, detailed workflow history of all past projects, inventory stock, inventory transactions and usage, all filled out forms and collected information. In case of a problem or recall, all traceability information is at your fingertips. You can drill down complex assemblies to find lot and serial numbers of used parts and materials, find what products used specific ingredient batch (in case of a problem with this batch), which products passed through a certain station, used a specific instrument or container, etc. Find all affected products, where and when they were distributed in minutes. Advanced data analytics (in progress) will help you make use of the collected information to forecast demand, identify trends, improve business operations efficiency, and pin-point the possible cause(s) of the problems that led to a recall.